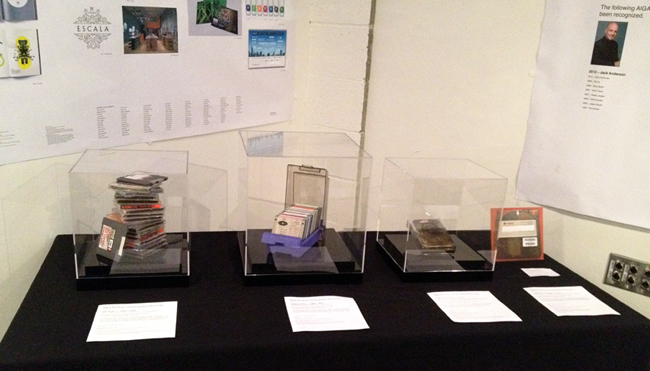 While Vivitiv was part of the Future of Design exhibit at the AIGA Seattle 25th Anniversary event, we also curated an Antiquated Technology Exhibit. The display consisted of useless storage technologies of the past including floppy disks, SyQuest cartridges, ZIP Disks and a fried hard drive. Considered at the time to be the pinnacle of digital storage technology, these outmoded devices contain untold design treasures that will never again see the light of day. Vivitiv was asked to participate in the Seattle Design Festival Design Marks Project. Vivitiv, along with 24 other local design firms, designed 8-foot tall location markers with QR codes where viewers could experience how the design of Seattle’s urban landmarks has influenced the city’s culture, and how that culture has, in turn, influenced design. Our video and installation was about The Seattle Art Museum and was titled “I Do Not Understand This Thing.” The aim of our project was to express the idea that the value of SAM lies not in the collection of paintings, film or sculpture housed within it’s walls, but in our relationship to it. More about the project here.